*in best Heather Small impression* You’ve got to search for the hero inside yourseeelllff…oh. Hello! Just warming up with a spot of M People. No, I’ve not been watching Miranda instead, all will become clear later on. 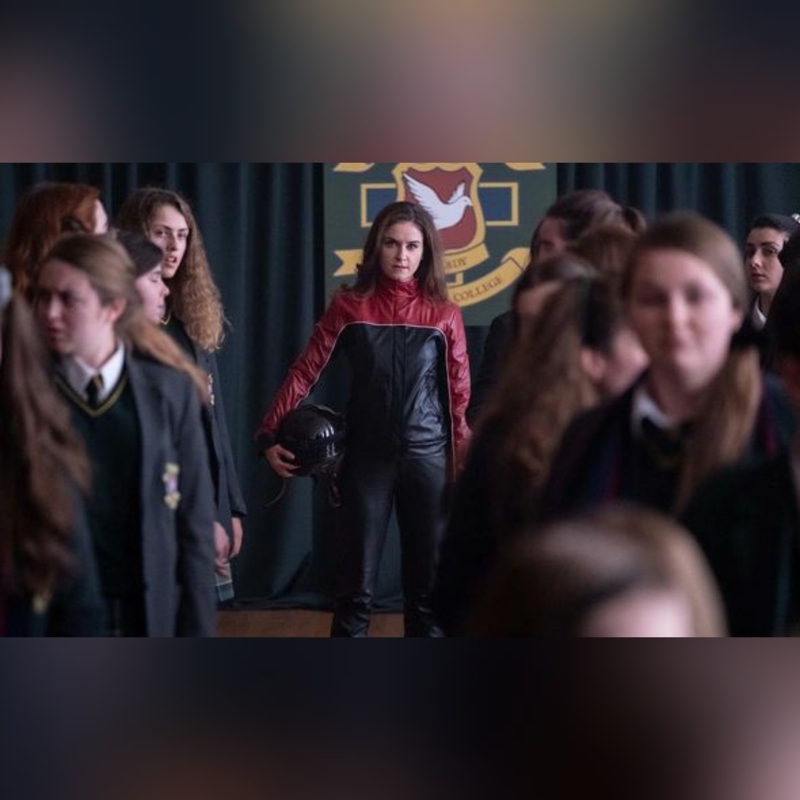 For now, let us bring you the lowdown on partie le deux of Derry Girls, series le…deux…? 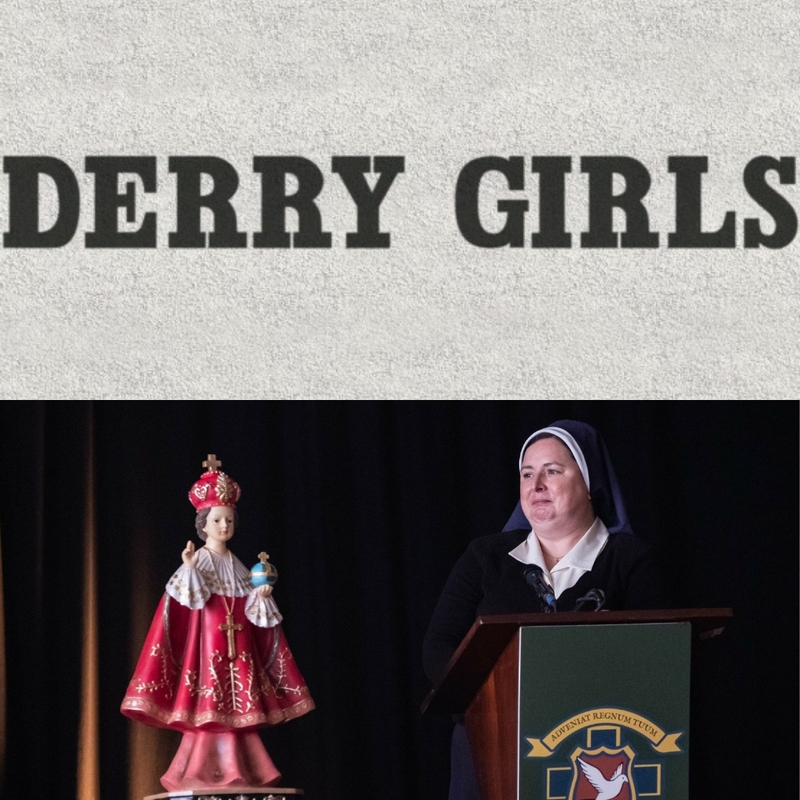 Let’s refresh back to Episode 1 firstly, to remind ourselves of Sister Michael’s words when discussing the differences and similarities between Catholics and Protestants: “It has to be said, I do love a good statue.” And boy does she prove that statement in style this week. For this week’s episode opens on a special assembly at Our Lady Immaculate College, at what is purportedly a handover ceremony of the shared ‘Child of Prague’ statue (or ‘Jesus as a wee bain’ as Michelle explains to James). Sister Michael, as you can see above, isn’t going to part with it easily, or indeed at all – chiefly because it doesn’t make any noise or fuss in her office. And she’s just announced to the girls that their old English teacher has left to take up a teaching post for savages (READ: in Belfast) when the school hall door bursts open, to everyone’s immediate attention. I mean, if you’re gonna make an entrance, then motorcycle leathers and untamed yet perfect hair is sort of the way to do it, no? This is their new English teacher – for this episode at least – called Ms De Brún. She’s sort of like Robin Williams’ character in Dead Poets Society, only more Irish and slightly more sarcastic. Her no nonsense approach to the – frankly poor – efforts for their poetry assignment (Jenny Joyce included) sends her off on a motivational speech/rant that inspires awe into them all, as she sets them the poetry assignment again – challenging them all to let their imaginations run wild this time. And for our four misfits and wee English fella, it proves harder than they initially thought. That night, Erin (attempting to pass off the theme to Home & Away as her own poetic work until James inadvertently rumbles her) and the gang get to work on their new poems – powered on the very Tunnocks Snowballs and Cadbury’s Roses in Ma Mary’s Christmas cupboard. Which naturally, an incensed Ma Mary finds out about when her and Da Gerry’s date night (with Aunt Sarah, Granda Joe and – Jesu – Uncle Colm in tow) at the cinema seeing The Usual Suspects is cut short due to a suspected bomb scare. Hats off to James, quite frankly. Also: moment to applaud the winged eyeliner action. After an hour or so of random quotes on life and philosophy being thrown around like every A Level English class cliche in the book (something from a poem of Erin’s about a glass doll being a symbol for emptiness and fragility), and a rejection of ‘posessions’ (meaning Orla can bagsy Erin’s Sylvanian Families collection) they leave, a very drunk Clare in tow – and are rumbled by the Joyce. Clare thinks her mum’s drunk and a bit inappropriate, to be honest. Cut to the following morning’s English class, and Ms De Brún is nowhere to be seen. In her place (although she’d rather pull out her own eyes) is Sister Michael. The gang naturally put two and two together, thinking that Jenny has got their new fave sacked after last night. And what does that mean? A statue kidnap ransom plot from their headmistress’ office of course. However, a scuffle between Michelle and James to position it for a ‘kidnap photo’ correctly means The Child of Prague becomes, well…a headless Child of Prague. Just as Sister Michael returns from her afternoon judo lesson. Loved the raiding of the Christmas cupboard.